I was still putting finishing touches on my list Friday night before the GT, putting details onto Intercessors and Tacticals, finishing my Chaplain, and painting up my display board. Saturday morning came quickly and I rolled up to my first game a bit scattered, having forgotten to bring my tray where I keep all my stuff organized. Round 1 was against Mark and his Carnifex-heavy Tyranids. His list was very shooting heavy, with 6 Venom Cannon Carnifexes, 2 large units of Hive Guard, and a 30 gant blob with Devourers. The mission for round 1 was Firestorm, with 6 player placed objectives scored progressively starting turn 2. The secondary was Marked for Death, where each player selects three units and gets points based on destroying them and destroying more than the opponent. 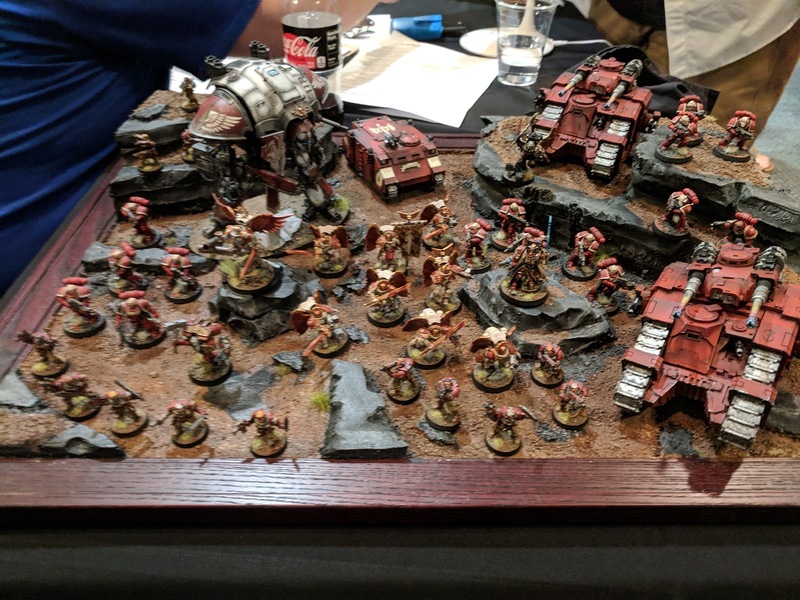 I nominated Mark's two Hive Guard units as well as the Devilgants, while Mark selected my two Bolter Scouts and Rhino. 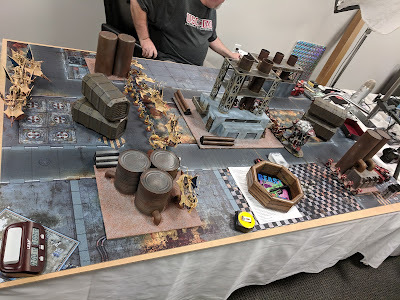 I won the roll for first turn and opted to go first, starting by using Forlorn Fury to jump my Captain forward before the turn, then running him ahead to Mark's front line, where there was just a large enough gap to walk through and into his Hive Guard. I failed my charge on my Knight, despite Landstrider, and ended up needing to fight twice with the Captain to get first blood. In Mark's turn he killed off the Captain with Smites and blocked off my Knight using his Termagants. Subsequent turns saw my Sanguinary bomb drop in and get into a cluster of three Carnifexes, while his dakka bomb of Shock Cannon Hive Guard and devilgants took up residence just ahead of his lines. In part thanks to my slow start, we were only able to play through four turns, which didn't leave enough turns for either of us to really take care of most of our Marked for Death units, both killing off one. I had been able to pin Mark back away from the Objectives and took a pretty commanding lead there early on, which was enough to earn me an 18-8 victory. Round 2 I was matched up against Roger and his Space Wolves, in the Dig Site mission. I got first turn again and threw my Captain forward, charging him into and wiping out a unit of Long Fangs. In Roger's first turn, his Storm Wolf flew up and annihilated both my Sicarans, much to my surprise. In my second turn, Mephiston took two Krak missiles to the face in Overwatch and died, and my Captain, who had miraculously survived a turn, charged into the Repressor, but the Knight who was supposed to help take care of it, failed his charge. 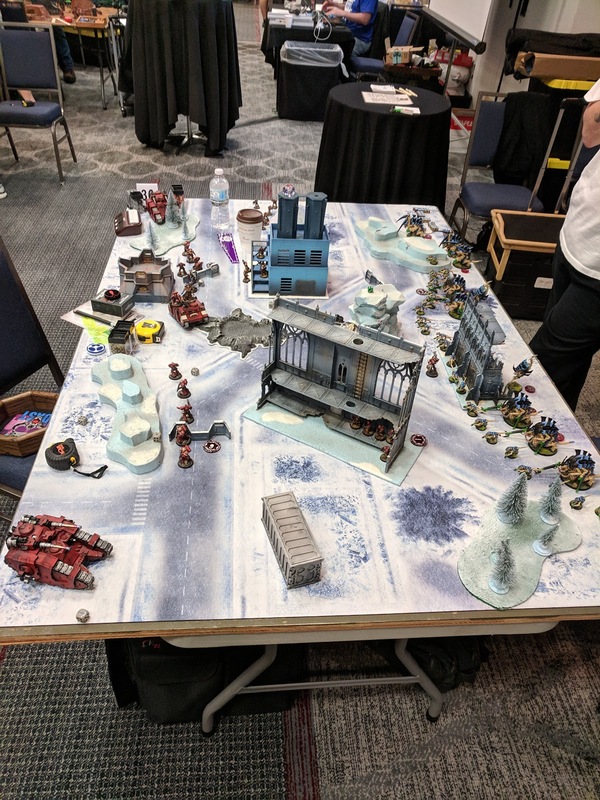 The Sanguinary Guard had to drop into my own deployment zone and take care of the Storm Wolf, though the were unable to keep the Grey Hunters inside from getting out. By turn three our big hitters would largely mutually destroy each other. This mission's unique mechanic was that the objectives could be scored progressively, but could go away when scored. After my turn three there were only two objectives left on the table, both on Roger's side. While he couldn't score progressively anymore, they would be worth 6VP at the end game. 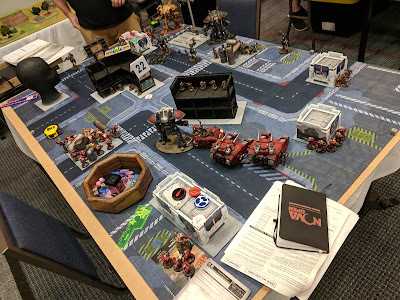 I spent my last turns trying to leap my Sanguinary Guard forward far enough to take one or both of these but Roger did a good job road blocking me and keeping them away. The game ended on turn 5 and, after totaling it up, I came away with a very narrow 19-17 victory. In my Round 3 I was matched up against one of my favorite opponents, Steve Bewley. 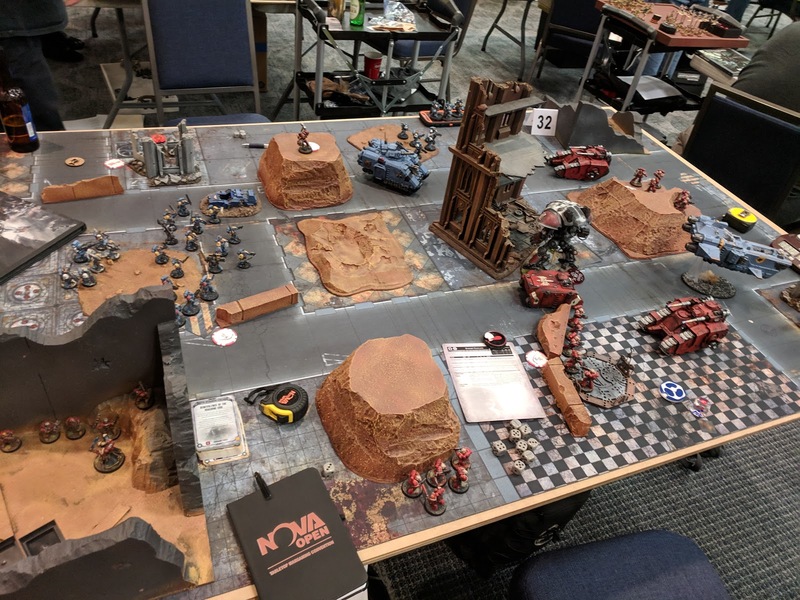 We first played at my second ever event, SCARAB 2014, and hadn't had a chance to play since the Forge the Narrative Seasonal in 2015. Not only would we get to play again, but we were selected to play on the stream. Steve won the game decidedly, and I pretty much did the exact opposite of what I needed to turn 1. I opted to be aggressive, even knowing it was the wrong play. I compounded that aggression by not re-rolling my short advance on my Knight and basically building a gameplan around a single Stratagem going off when my opponent had Vect and all his Command Points. Steve's always fun to play, I just wish I could have given him an actual game, instead of just playing out what I knew was a lost cause. 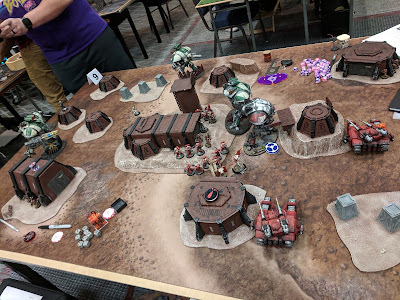 On day two I rolled in a bit better prepared for my Round 4 game against Mike B from the Dangli Boyz Podcast and his Knights and Assassins. The mission was primarily points destroyed and so, we lined up to mash each other as best as we could. Mike got first turn and moved up, using his Gallant to blow up my Rhino, which was shielding my Gallant from a turn 1 charge. I overlooked that he'd taken the Sanctuary relic on it, so failed to kill it in my turn, but my Gallant managed to survive the following turn and then take it down in Mike's turn, followed by taking down the Crusader in my turn, dealing a whopping 40 damage with the Paragon Gauntlet. My Sanguinary Guard dropped in on his Helverins but were just short of being able to trap the second one, and then were shot and stomped off the board by the Preceptor. Mike moved up on my base of bodies and characters that were still stuck in the middle, having been in a series of slap fights with a Culexus nearly all game. The game continued to turn 6 and while the Preceptor was able to move up and wipe out several more units, it put him in range for a charge from my Knight on one wound who powered up with my last command point and ripped it apart. Despite the tabling, I also had very little left, meaning it was a narrow win on Primary. The Secondary was about board control so I won largely on that, bringing about a final score of 23-6, which definitely belied how close the game really was. For my final round of the event, I was matched up against Dean, aka Dernicus, from Field of Fire. Dean was running a brigade of totally loyal (and in no way genetically compromised, they're just follically challenged) Cadians with a Raven Castellan and a Mortan Crusader and two Warglaives. This mission featured four end-game objectives worth varying points based on how close they are to your side or your opponent's. I won the roll to choose deployment for the first time all weekend and chose a Vanguard corner with a decent line of sight blocker to shield me from the Castellan. I also won the roll to go first (for the fourth of five games) and opted to go first. I used Forlorn Fury and jumped my Captain forward, suiciding him into a Warglaive to secure first blood. The rest of my army largely moved up to get in better position, with my Sanguinary Guard jumping behind the large building in no-mans-land. We traded blows back and forth, with my Knight standing back up for the first time all weekend to crash into Dean's Crusader and taking it down before being killed off for good. My Sanguinary Guard managed to repeatedly wrap up a guardsman and keep themselves in combat for a while, slowly churning through all of the infantry Dean had. The game continued on to turn 6 and Dean was left with a Mortar team and the Castellan, while I had a lone Sanguinary Guard, Chaplain, Sanguinary Priest, and Ancient. I also had my Rhino and a scout squad to start the turn, but Dean removed them once I moved onto objectives, leaving him on my midfield objective (worth 5 points) and myself on his backfield objective worth 7 points, for a narrow win. The final score was 22-14 for my fourth win of the event. I ended Warzone: Atlanta with a 4-1 record but by far the fewest BP of anyone else with 4 wins, with only 83 points, good enough for 63rd place. The next lowest 4 win player was my good buddy Ricky, who was in 50th with 88 points. For reference, last year I was 3-2 with 98 BP. Had I managed to score the very achievable 7 points from my Round 3 game, and 5 more points from my Round 1, which I think I get if we have time for a fifth turn, I would have ended up at 95, for a comfortable 35th place. That said, more points in those earlier rounds means harder games in the following rounds, so all of that is speculative. To wrap up, I had an absolute blast, as always. Tons of thanks and praise are due to the General Staff, lead by Kelly Wallace, for putting on a world class event every year. If you haven't been, definitely try to make it next year - hopefully there will be more tickets available. I know it's already on my calendar for Veterans Day weekend 2019.